CallNote is one of best free Skype recorder for Windows works automatically on your Skype through capturing calls whether audio or video. Additionally, CallNote Skype recorder also captures chats and shared screens. Basically, it is a convenient software with the ability to record calls and also manage all your recordings. On good thing about this tool is that, whether you launch it manually or automatically, you can pause and resume the on-going recording. On the same call, you can also take instant video snapshots. This is amazing given that this tool can multitask by recording up to 8 calls simultaneously. CallNote saves the participant names, duration and call time every time a recording is made. CallNote is one of the main call Skype recorders with a number of advantages compared to similar applications. It is easy to use and to execute all the commands. 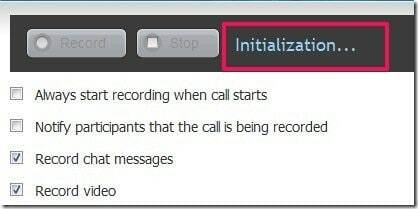 You can follow the following few steps of how to acquire and start using the tool for recording your Skype conversations. This application is offered in some websites as a freeware. You can start the normal process of downloading by searching simply ‘CallNote for Skype’ or something close to that. The results will display to you options from where you can select to download. After downloading, double click on the file to begin the process of installation. You can open to view the window of the application. From the application window you can view all the tools used for recording a call. By clicking the ‘record’ key, the application will start recording call automatically. The CallNote Skype recorder automatically search and synchronize your Skype account. The CallNote recorder will send a notification every time you make a call using Skype. You can choose manually how you want your calls recorded as indicated by the window above. You can always take a snapshot during a conversation and without interrupting any process. It is an important feature that will enable you to keep basic records in terms of pictures alongside having either a video record or a chat record. It is an easy process to take a snapshot and as you will sport the provision for taking a snapshot on the window of the application. You can save the records in another account online or share to various locations like Facebook, YouTube and so on. You will select the account button to access the sharing options. The CallNote application make it possible for you to record both audio and video. It can do so automatically for personal video chats and go to meeting. The tool allows you a specialized editing making you to produce high quality videos by removing unwanted parts, adding titles and so on. 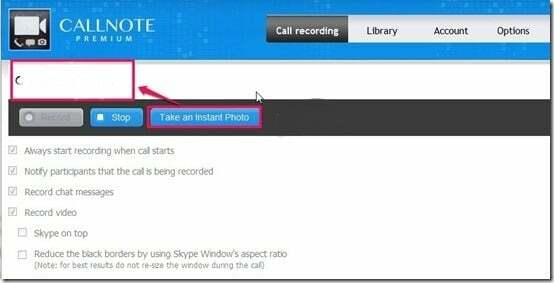 Using this application, you can be able to take Skype call snapshots. 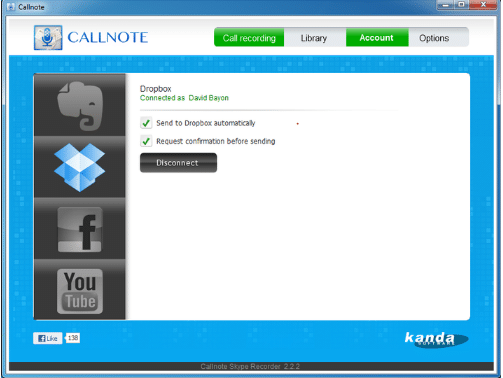 The CallNote application can also share or upload your recorded files to Google Drive, You tube etc. The application will enable you to web EX online meetings and conversations. The premium version of this application may not be able to record HD videos. This application comes with a cost, you will spend in order to get it or an upgraded version of it. Recording both video and audio means you need to have a good space in your computer to accommodate all your recordings. For a more friendly integration between Skype and CallNote, you will need to configure this tool to get the best results. This software needs to be open on your desktop for easy monitoring when recording. When your call connects in Skype, click the Record button. To avoid all these hustles, you will need to configure this tool in a way that it can record immediately your call connects on Skype. This way, there will be no much manual work when trying to connect the two to work together. Additionally, you set your CallNote to automatically notify you when the call will be recorded. You will need to re-arrange your Date and Time columns by clicking an arrow on options. This can be done in either ascending or descending order. At the participants’ column, there is a cursor that you can hover just below the icon and a bubble will provide the participant’s information. Also, the duration of the call will be displayed on the column. At this stage, click the Edit icon and change the name of the recording. On the editing icon, you can as well add notes. You will notice that Date, Time, duration and participant details are automatically noted at the note field. After everything is done, you can later play your recordings from the note or in the Play column at the library entry. Should you choose to play the recording, the tool will automatically send you to iTunes. This will turn you and wish to have the recordings saved on your music. We are no longer analogue, with Skype and CallNote, nothing will ever go unrecorded for future reference. Be glad and forget the bad days. This tool will deliver to your wish in the best way possible. Record, save, share, and manage all your Skype conversation and change your lifestyle. However, this software has few limitations, if you wish to do more, consider having the Talk Helper Skype Recorder for a more advanced services free of charge. Meanwhile, work with CallNote!